The PRS10 is an ultra-low phase noise, 10 MHz rubidium-disciplined crystal oscillator. The device fulfills a variety of communication, synchronization and instrumentation requirements. The phase noise of the 10 MHz output is low enough to be used as the reference source for synthesizers. The unit's short-term stability and low environmental coefficients make it an ideal component for network synchronization. Its low aging rate makes it an excellent timebase for precision frequency measurements. Datasheet > FS725 Rubidium Std. The PRS10 can time-tag an external 1 pps input with 1 ns resolution. These values may be reported back via RS-232, or used to phase-lock the unit to an external reference (such as GPS) with time constants of several hours. This feature can provide Stratum 1 performance at a very low cost. The PRS10 establishes a new level of features and performance in atomic frequency standards. Its design provides the lowest phase noise, greatest versatility, and easiest path to system integration of any rubidium frequency standard available. All commercial rubidium frequency standards operate by disciplining a crystal oscillator to the hyperfine transition at 6.834,682,612 GHz in rubidium. The amount of light from a rubidium discharge lamp that reaches a photodetector through a resonance cell will drop by about 0.1 % when the rubidium vapor in the resonance cell is exposed to microwave power near the transition frequency. The crystal oscillator is stabilized to the rubidium transition by detecting the light dip while sweeping an RF frequency synthesizer (referenced to the crystal) through the transition frequency. 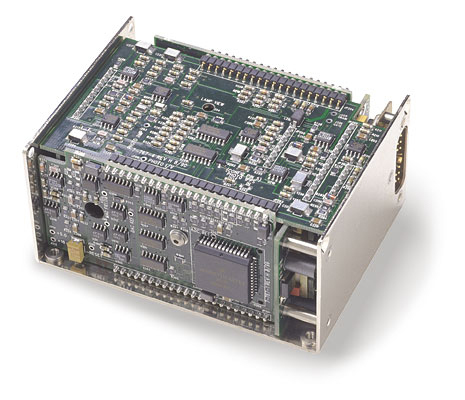 The PRS10 uses a microcontroller, clocked at 10 MHz, to control all aspects of operation and to allow diagnostics, measurement, and closed case calibration via an RS-232 interface. The processor sweeps the RF synthesizer, synchronously detects the optical signal from the physics package, and servos the 10 MHz crystal oscillator to the rubidium transition via a 22-bit DAC and a varactor. When turned on, the processor applies a voltage to the varactor corresponding to the last locked value. The frequency-lock servo is disabled until a useful resonance signal is detected from the physics package, providing a smooth transition to the final frequency as the unit warms up. In the case of a problem with the physics package, the unit will suspend the frequency servo and hold the varactor voltage at the last locked value. Manufacturers of rubidium frequency standards sometimes use a crystal frequency that is an exact sub-multiple of the hyperfine transition frequency in order to simplify the design of the RF frequency synthesizer. Some designs use a DDS synthesizer, clocked by the crystal, to generate the 10 MHz output. Often, the crystal frequency is modulated in order to sweep the synthesizer through the transition frequency. The crystals are usually operated in the fundamental mode and not temperature stabilized. While such approaches are simpler to design, the phase noise, short-term stability, and spur content of their outputs suffer. In contrast, the 10 MHz output from a PRS10 comes directly from a 3rd overtone, stress-compensated (SC-cut) crystal oscillator operated in an oven at its plateau temperature. A dual-loop RF synthesizer, with a crystal IF at 22.482 MHz, is used to generate 359.72 MHz and make 6.834 GHz via a step recovery diode. There are several advantages to this approach: the phase noise is very low (<-130 dBc/Hz @ 10 Hz offset), there are no spurious components, and the output will be well behaved should the physics package fail to provide a lock signal. (The aging will be about 5 × 10-10/day when not locked to rubidium.) The phase noise plot of a PRS10 shows a 42 dB reduction in phase noise at 10 Hz offset from the carrier at 10 MHz when compared to a conventional rubidium standard. Historically, the lifetime of rubidium frequency standards has been dominated by rubidium depletion in the discharge lamp. To avoid excess flicker noise, manufacturers would load less than 100 µg of rubidium into spherical discharge lamps. 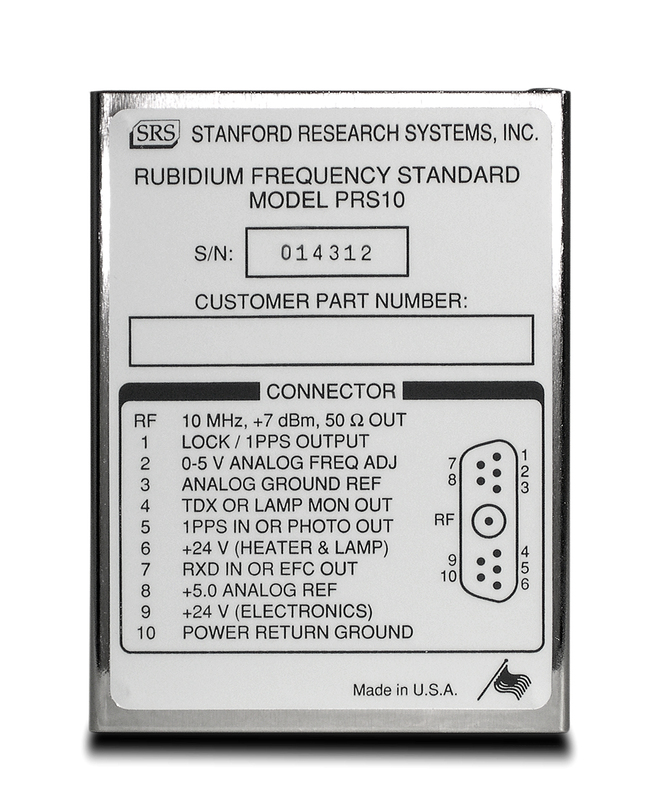 The PRS10 uses a lamp with a side arm loaded with 1 mg of rubidium. This design eliminates rubidium depletion as a failure mechanism, and provides better temperature control without excess flicker noise. Frequency offsets and long-term aging of the PRS10 can be eliminated by phase-locking to a source with better long-term stability, such as the 1 pps from a GPS timing receiver. As shown in the Allan variance plot, the short-term stability of GPS is poor (about 5,000 × 10-12) compared to the stability of the PRS10 (about 5 × 10-12). However, over several hours, GPS is more stable, and so the stability can be improved by phase-locking the PRS10 to GPS with a long time constant. The PRS10 can time-tag or phase-lock to a 1 pps input, and provides a slewable 1 pps output. The input can be time-tagged with 1 ns resolution, and the result may be read back via the RS-232 interface. When tracking an external input, the time constant can be set from 5 minutes to 18 hours. The 1 pps output may be moved with 1 ns resolution over the range of 0 to 999,999,999 ns via the RS-232 interface. When an external 1 pps signal is applied, the PRS10 will verify the integrity of that input and will then align its 1 pps output with the external input. The processor will continue to track the1 pps output to the 1 pps input by controlling the frequency of the rubidium transition with a small magnetic field adjustment inside the resonance cell. 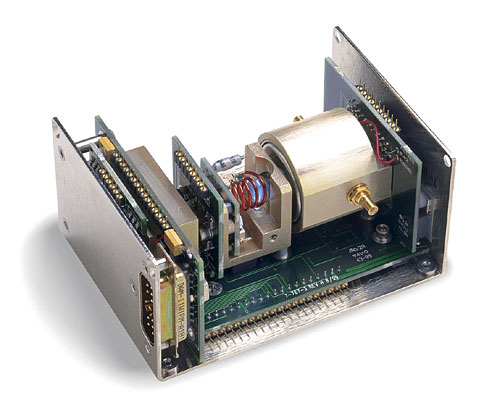 The interface connector and device form-factor are compatible with Efratoms Model FRS rubidium frequency standard. In its default configuration, the PRS10 uses pins #4 and #7 for the RS-232 interface to provide a complete set of systems diagnostics and control. Internal hardware jumpers allow these pins to be configured as analog outputs to monitor the lamp intensity and varactor voltage for complete compatibility with the FRS. 1. Low power warm-up option is available. Contact factory for details. 2. Lamp lifetime is the dominant consideration in the design life estimate. The estimate is based on the measured reduction of lamp intensity and the elevation of lamp start voltage with time.